Where We're Going is our newsletter. 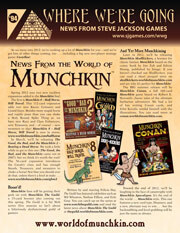 We send physical copies to conventions, and post it online for the delight and entertainment of the whole infosphere. Or something like that . . .
Use your browser either to view it directly or to download the PDF. Browser controls differ, so if you don't know how to choose viewing vs. downloading, check your browser's help menu. Or just click the link to see what happens.